Our App lends itself well to the field of house design & architecture or to any professional owning either an iPhone and/or an iPad. A drawing & sketching app for architecture. Keyplan 3D has been developed with architecture in mind and offers the exact same set of features and complexity on both the iPhone and iPad. We designed a tool which lets professionals draw the main structure of a plan with our unique wall-by-wall intelligent engine. In the field of architecture, our App can be a very useful tool as it combines both speed & mobility. Amongst all the architectural Apps on the iPad and/or iPhone, Keyplan 3D is the only one to provide such freedom. Without any constraints, using an intuitive approach, architects can draw from the inside-out, placing rooms within rooms, dividing existing rooms, adding single walls, etc. Everything is done with the same simple tool. The power of our drawing tool makes our app a unique iPad and iPhone app for architecture. Printing, sharing your 2D plans and 3D images. Keyplan 3D comes with advanced sharing capabilities. In the real world, you can, if you so wish, share your creations with architects via the project menu into a variety of formats : email, Facebook or Google+. Our App automatically generates a preview of your 2D plan as well as an aesthetic 3D representation of your creation which can then be sent to architects, real estate agents or house builders, as a starting point or even to correct initial plans. Do not hesitate to use our App, Keyplan 3D, as a powerful architecture communication tool, where a picture is worth a thousand words. Customization : many parameters to be changed in 2D and 3D. 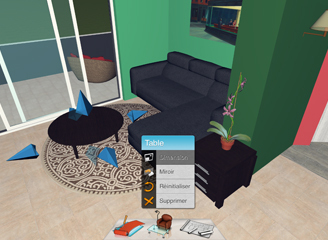 Keyplan3D is a fully editable App and runs in real-time on the iPad/iPhone. What this means is that you can change any parameter, be it in the 2D or 3D mode, in an instant. Wall height can be adjusted and your plan will be updated immediately : this is a whole new way of approaching architecture and the concept of home design. You can experiment and make tweaks on the go as your structure evolves. This novel approach allows you to make creative decisions, all the while having an enjoyable experience, through a smooth and imaginative process. The same applies to wall width and even wall positioning; adapting a room according to its furniture size is also a possible with our App. Every plan and structure you create belongs to you. As an architecture enthusiast or professional, or even as an interior designer, your have absolute freedom to do as you please with our App and share your plan or design with your customers. A design tool, with many possibilities. 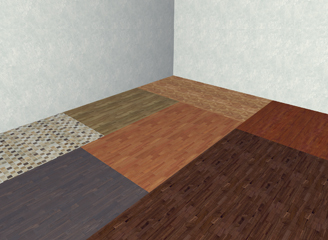 Our house design App offers a new tool where walls are automatically attached to adjacent rooms if necessary. What this means is that you can create imbricated structures and complex shapes with great ease in either the 3D mode of 2D plan overview. A wall belonging to a room can be hidden for added control. It is also possible to create different surfaces in the same room. Adding openings with fully resizable dimensions contributes to making your design even more unique. An open kitchen next to a cosy living room with a custom bar separating is one of many ideas that can be achieved in Keyplan 3D. Shaping Keyplan 3D into a richer experience for free. Our team is dedicated to bring you updates and new features on a regular basis in a quest to shape our App, Keyplan 3d, into the most complete experience out there. Gardening with hundreds of trees powered via a landscape editor is one of our dream project. Adding floors to your house to reach even higher dimensions, with an automated roof builder is also planned. Expect a custom furnishing editor as well as an interactive wall painter tool at some point in the near future. 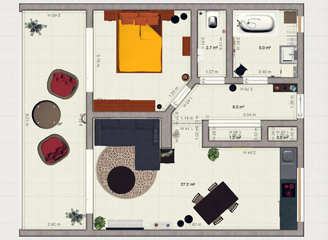 Put simply : prepare yourself to be amazed with every iteration of Keyplan 3D.